We investigate a class of models related to the Bak-Sneppen model, initially proposed to study evolution. The BS model is extremely simple and yet captures some forms of “complex behavior” such as self-organized criticality that is often observed in physical and biological systems. In this model, random fitnesses in [0, 1] are associated to agents located at the vertices of a graph G. Their fitnesses are ranked from worst (0) to best (1). At every time-step the agent with the worst fitness and some others with a priori given rank probabilities are replaced by new agents with random fitnesses. We consider two cases: The exogenous case where the new fitnesses are taken from an a priori fixed distribution, and the endogenous case where the new fitnesses are taken from the current distribution as it evolves. We approximate the dynamics by making a simplifying independence assumption. 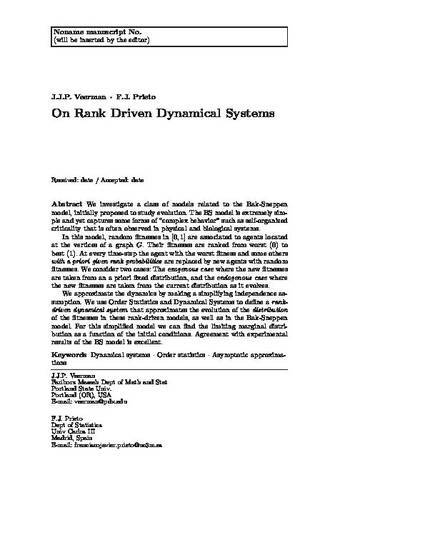 We use Order Statistics and Dynamical Systems to define a rank- driven dynamical system that approximates the evolution of the distribution of the fitnesses in these rank-driven models, as well as in the Bak-Sneppen model. For this simplified model we can find the limiting marginal distribution as a function of the initial conditions. Agreement with experimental results of the BS model is excellent. This is the post-print version of an article which was subsequently published in the Journal of Statistical Physics, Copyright (2014) SpringerLink.